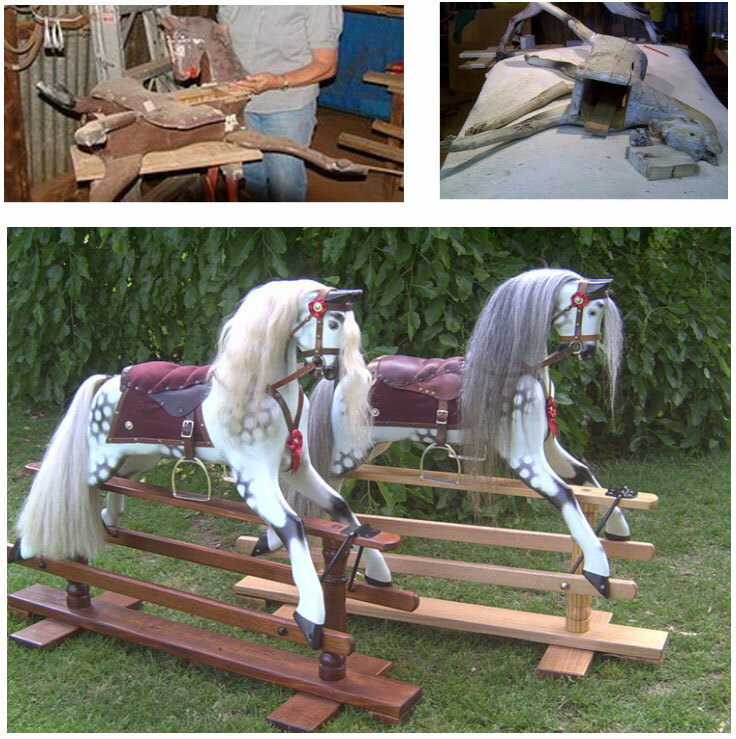 Restored horses have 9 coats of paint in total – 2 sealer, 2 undercoat, 2 top coats, 1 hand painted dapples and 2 clear sealers to finishing off and protect the dapples. Original red Roebuck stands are pulled down, joints cleaned out, wedges replaced, then reassembled and fully restored. Stands can also be replaced by stain wood stands replicas of the pre 1930 stands. Traditional cow tail mane and tail are used with a choice of Stewart or Black Watch Tartan or material or tartan of your choice, all leather harness, leather saddle flaps with suede seats and nickel coated English stirrups. The majority of horses found in NSW are Roebucks made in Sydney from the early 1900s through until 1972. Initially they made 6 different sizes of horse. In the mid 1930s they produced standard No 3. The dappled artwork is copied off an original No 5 Roebuck pre c1920s and can also be copied from old family photos showing the horse in original condition if available. Bartletts are air brushed and detailed as they were originally. All horses restored and/or sold leave with a “Certificate of Authenticity” giving details of its history, maker and before and after photos of restoration. 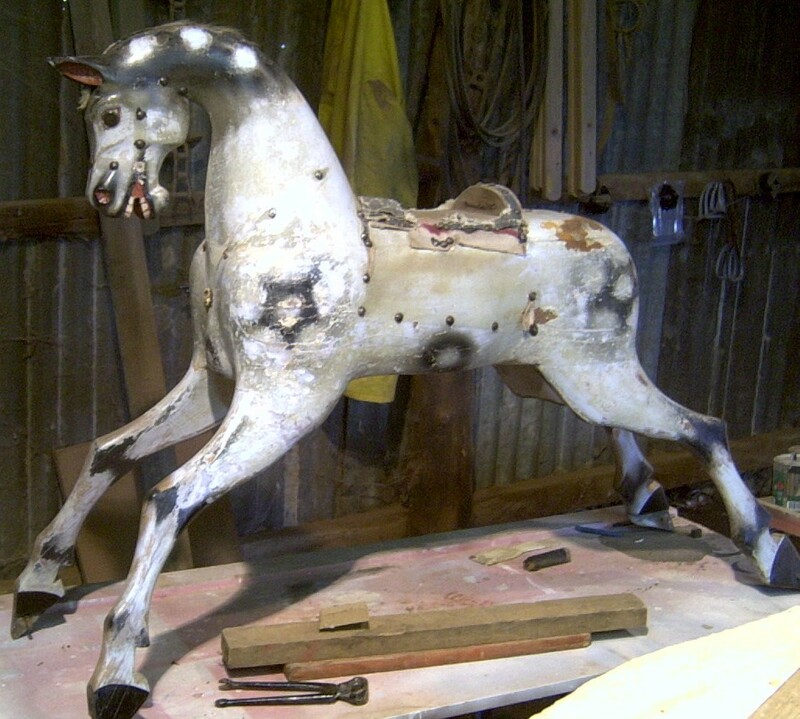 Sorry, I don’t restore skin horses but check the link below. Paddy (above) A Roebuck built in the 1950s had been owned by the same family for 3 generations and has had a full restoration, ready for the grandchildren to enjoy. He has blonde cow tail mane and tail, leather harness and sits on his original stand in Roebuck’s traditional red colour. Paddy was named after the family’s favourite real pony and has gone home to the central west of NSW. Grace (below right) had been stored in a garden shed for many years. She was badly dried out and cracked with loose joints. She also had a break to the muzzle. 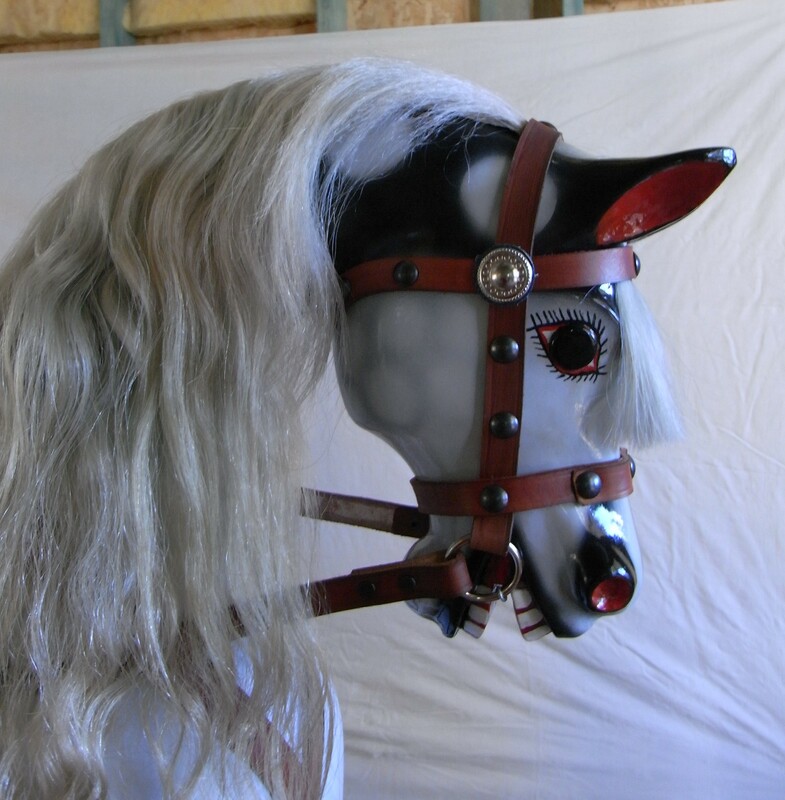 She has been fully restored, has grey horse hair mane and tail with all leather harness and placed on a new Ash stand. Her name was chosen after an article in the newspaper cutting in her saddle stuffing announcing the release of a documentary “A Look at Monaco”, Princess Grace first film role in seven years in a role as herself as Princess of Monaco. Bradley had spent many years in a woodshed and has been fully restored. His stand is made of stained Ash. He has leather harness and bridle, burgundy suede saddle cloth and seat of the saddle. His mane and forlock are traditional blonde cow tail with a horse tail. Both made Frederick Roebuck and Sons in Sydney Grace in 1963 and Bradley somewhere from early 1960s to 1972, when the factory closed. Grace has gone to a new home in Leeton and Bradley to Geelong. Below: Evanthea – made in Melbourne by Bartletts around 1945. Purchased in Melbourne close by the Westgate Bridge, fully restored and returned back to a new owner in Melbourne in 2009. Restored as near as possible to the past restoration carried out by Bartletts with a heritage green stand.